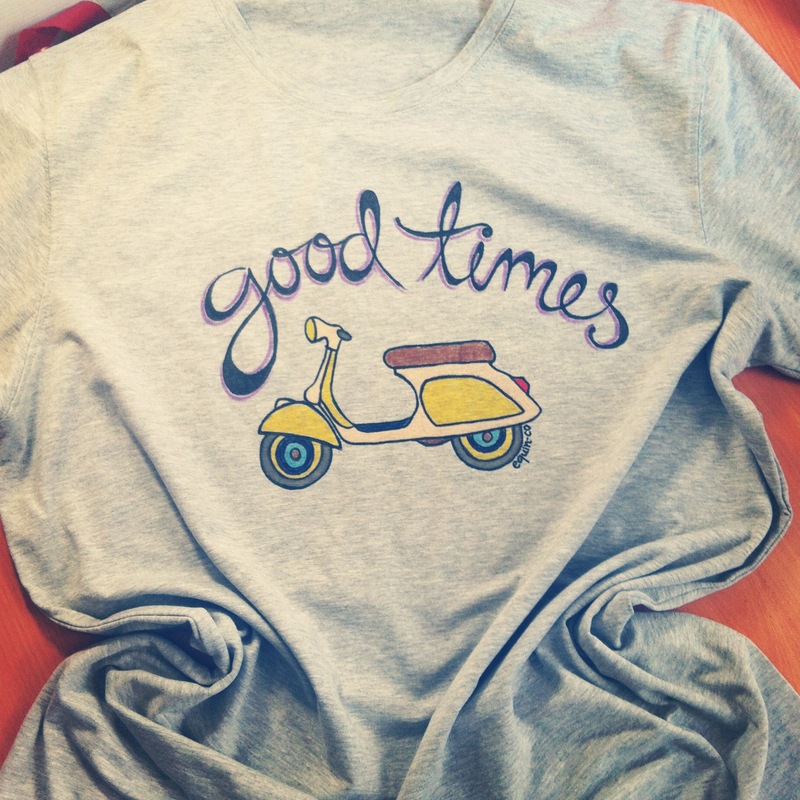 Today, i shipped out a fresh new design, both featuring vespas, my favorite relaxing, vacationing, traveling tool. He apparently likes them so much, i made a “favorites” tee, with vespa featuring second place along with sushi and a computer. What? Yea, you read it correct. BUT, more on that later! 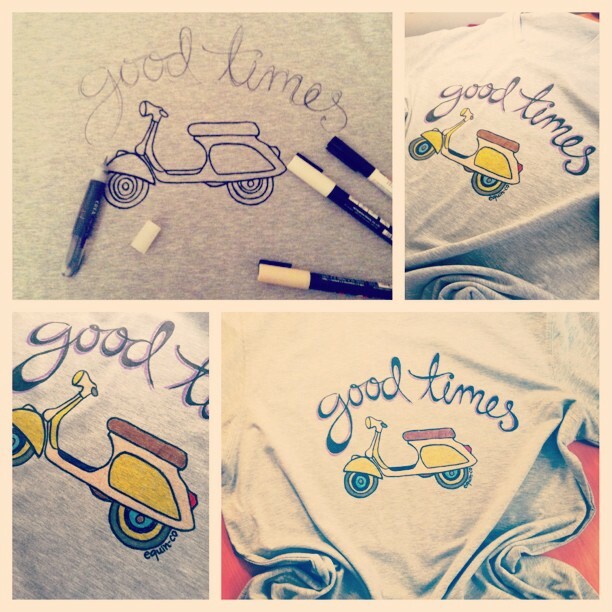 My magical process of making these magical tees! 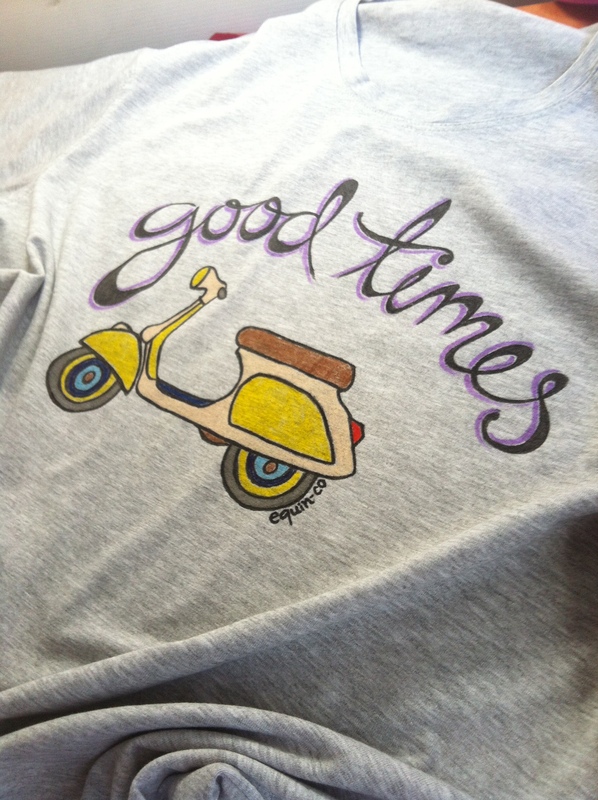 “Good times” lettering and vespa illustration, designed and hand-painted by equin-co designs. I have taken a little break from blogging, well, because… Simply because I had sooo much hands-on work that I needed to do that took time away from blogging world. Anyhow, here I am! With a lovely client and an interesting order… The girl who ordered these t-shirts is so much in love with her boyfriend. Whom she met at a photography club. They both seem to enjoy taking pictures, (and have the same initials!) so she asked me if I could draw a girl taking a picture of a boy- and a boy taking a photo of a girl. Enjoy these his’n’hers t-shirts ! Blog yazmaya ufak bir ara vermistim, cunku… Cunku fiziksel olarak yapmam gereken cok sey vardi! Bunlar icin de klavyeden bir sure uzak kaldim. Her neyse, cok ilginc bir musteri/siparis ile buradayim… Bu tisortleri siparis eden kiz erkek arkadasina cok asik. Ikisinin de gittigi fotograf klubunde tanistigi erkek arkadasina. Ikisinin de ortak hobisi olan fotografciligi (ve ortak olan isimlerinin bas harflerini) resmetmemi rica etti. Birinde kiz erkegin fotografini cekerken, digerinde ise erkek kizin fotografini cekerken. .
Veeee, size kiz/erkek uyumlu, fotografcilik temali bu tisortleri takdim ediyorum! And yet another “Keep Calm” madness… It has been quite a hit and there are a million derivatives out there, but I wanted to add my own! There are so many “bitchiness” and short tempers and madness in the world, let me be the one that spreads the moto- chillax, dude. Veee, bir baska “Keep Calm” cilginligina benden bir eklenti.. Simdiye kadar milyonlarca turevi olusturuldu, hepsi de tutuldu, ben de kendiminkini ekleyeyim dedim! O kadar sinir, stres, sirretlik var ki bu aralar, kime baksam, “bir rahatla yahu” diyesim geliyor. Onlara ve umursamadan yasayanlara gelsin bu seri! The Owlsome Crew hired new members! So you know how like to gather up mindless surprised curious owls in a bunch and call them a “crew” or “buddies”. The creation of this latest version took a little more than I expected, because, well, it did! I wanted something different, something a little diverse in this set, because everyone seems to dig my owl collection, so I wanted to offer something more versatile to every customer. Just in case, I’ll add the former ‘original’ set of the crew, so you can see the difference for yourself. Tipi kayik, saskin, merakli ve bisssuru baykusu bir araya toplayip onlara “ekip” demeyi ne kadar cok sevdigimi biliyorsunuz. O yuzdendir ki, “owlsome crew”un bu son versiyonunun yaratim sureci tahminimden biraz daha uzun gecti. Cunku.. cunku, iste! Daha farkli, daha baska yerlere bakislar atan, garip baykuslar istedim bu sefer. Herkes bu baykus ekibini cok seviyor olmali ki, musterilere daha degisik bir seyler sunmak istedim. Nolur noolmaz, ben yine de ‘orjinal’ ekibi de ekleyeyim, farkliliklari kendiniz kesfedin! “The Owlsome Crew” owl illustrations in mutli color designed and sketched by equin-co designs. Photographed using negative filter. Close up from “The owlsome crew” two owls- sketched and colored then filtered by photo filter by equin-co designs. “The owlsome buddies” owl illustrations designed and hand painted by equin-co™ designs. “The owlsome crew” owl illustrations and hand-painting by equin-co™designs. Here are some puppy- dog illustrations and handmade equin-co t-shirts I’ve been creating lately. Simdi coktaan balli sahiplerinin uzerlerinde saliniyorlar bu kopecikler. Puppy love ismini verdigim koleksiyonumdan, kopek cizimleri, ilustrasyonlari ve tabii ki el yapimi equin-co tisortler! Close up- illustration from the t-shirt. Courtesy of equin-co™ designs. “Puppy love” dog illustrations in black silver and red on white cotton t-shirt, courtesy of equin-co™ designs. General view- “Puppy love” dog illustrations in black, silver and red on white cotton t-shirt. Courtesy of equin-co™designs. “Puppy love” dog illustrations in white on navy blue cotton t-shirt. Design and application by equin-co™ designs. “Puppy Love” dog illustrations in black on bright pink cotton t-shirt. Courtesy of equin-co™designs. Close shot “Puppy love” dog illustrations in black on bright pink cotton t-shirt. Courtesy of equin-co™designs. “Puppy love” dog illustrations in black on navy blue striped cotton t-shirt. courtesy of equin-co™designs. “Puppy love” dog illustrations in black on navy blue striped cotton t-shirt. Design and application by equin-co™ designs.